There are a lot of people who say they don’t eat dog meat and yet they also don’t oppose dog meat consumption. That’s because they view eating dogs as no different from eating cows or pigs, they view eating dog meat as a matter of personal preference, or they think it should continue as a part of traditional culture. But are these perceptions valid? 1. 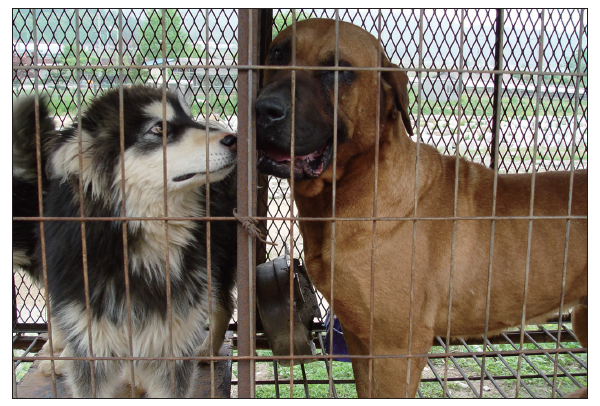 Pet Dog Auction Markets: Sick dogs or large dogs are sold cheaply for human consumption. 2. Puppy Mills: Sometimes bred as companions or sometimes for meat, dogs are distributed based on whatever ways brings in the most money. 3. Certain Special Pedigree Breeding and Promotion Centers: Dogs that don’t meet the arbitrary standards are sold to meat markets. 4. Certain Animal Shelters: Shelter operators profit from selling dogs to meat markets. 5. Certain Veterinary Hospitals: There have been cases of euthanized dogs and cats being distributed to meat markets. 6. Dog Traders: Stray dogs wandering around the streets are seen merely as meat to dog traders. 7. Certain Dog Owners: Dogs that people have raised or stolen are sold to dog traders. 1. Dogs for consumption are different, aren’t they? The KBS TV program Consumer Report investigated traditional outdoor markets that distribute most of the dog meat in Korea and found that it was typical for “pet dogs” to be secretly sold for consumption. Not only larger breed dogs such as Malamutes, but also small breeds such as Shih Tzu, Maltese, Cocker Spaniels are being sold. And many of these small dogs are used to make Dog Soju (dog elixir), where after being cooked their shapes and breed cannot be identified. All dogs are born with their own unique characteristics and personalities, and yet people arbitrarily classify some as “dogs for consumption,” if they are killed and eaten, and others as “companion dogs,” if they are pets. 2. Why should companion animals be treated differently? How companion animals and humans form relationships has a major impact on society. That’s why animal protection organizations continuously work to abolish consumption of companion animals. Some say dogs bred as companions are different to dogs bred for consumption, but they are not different, they just have different rules applied to them. So even if the Animal Protection Law prohibits cruelty and slaughter, and even if a person who brutally tortures and kills dogs in a cruel way is reported, they can make excuses, such as “What is the problem if the dog was raised for consumption and it was going to die anyway?” The reality is that as long as dog meat consumption is accepted, the protection of and respect for the lives of all companion animals will be difficult to achieve. 3. Isn’t it a matter of personal preference? China banned the consumption of monkey brain and foie gras is now being shunned by people. In China, there is even a movement to push forward the enactment of a law to ban dog meat consumption in progress. And other Asian countries that used to eat dogs are gradually banning dog meat consumption. Philippines banned dog and cat meat consumption in 1998, and Taiwan and Thailand banned dog meat consumption in early 2000. These cultural changes reflect what the majority of people in a society want. Among things we eat, there are certain animals that as a society we do not want to see farmed for food. It is not a matter of personal preference, but what society as a whole wants. 4. How about cows and pigs? Shouldn’t they be helped as well? Campaigning for the welfare of animals that have already become livestock and campaigning against the consumption of companion animals are separate matters. They are different because the animals involved are different in terms of their circumstances and in terms of their place in history with humankind. This means there are many complications involved depending on which animal you are trying to help. In the case of livestock animals, what is currently achievable is the improvement of living conditions and a reduction of meat consumption. For companion animals, it should be possible to ban their use for consumption entirely within our lifetime. Just because the plight of cows and pigs is pitiful does not justify forcing companion animals to endure the same plight. 5. Isn’t dog meat our traditional culture? In this painting, you can feel the warm expression of a boy who loves his dog and the dog’s happy and cheerful playfulness. 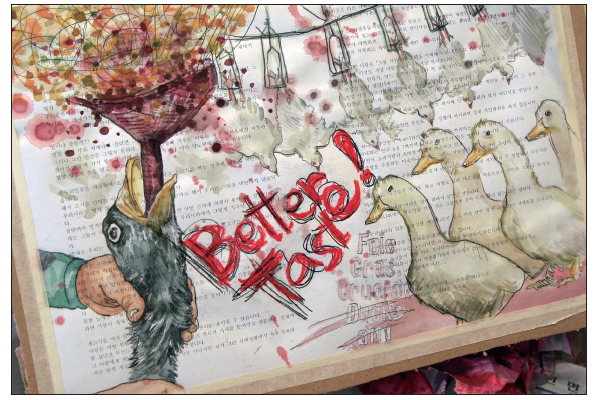 ©Shin Kwang-Hyun (1813~? 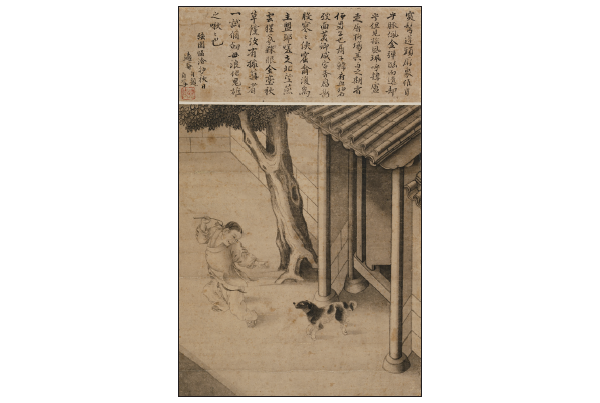 ), <A boy calling his dog>, Possession of the National Museum of Korea, Late Joseon Dynasty. During the Joseon Dynasty (1392~1897), many books that contain stories about dog meat consumption spread to Korea from China. After both wars, a political party called Seo-In assumed the reins of government and drastically came under the influence of China and its practices. To make matters worse, in the 17th century Korea suffered a great famine due to an abnormal change in weather. It is said that people slaughtered and ate all animals and even dug up graves to eat dead bodies. So in the past, certain people have eaten dog meat as a desperate measure, but most have stayed away from the taboo of eating dogs. A representative example is the Dong-Hak movement, (an ethnic faith founded in the 19th century by Choi Jae-Woo) which the majority of Joseon civilians followed and which included the banning of dog eating. Even if dog meat consumption existed in Korean history, this cannot be used to promote dog eating as a cultural tradition specific to Korea. Dog meat consumption used to be practiced in many countries. 6. What about cultural relativism? Fox hunting is a traditional English blood sport. Wealthy landowners on horses use dozens of dogs to chase and then maul foxes to death, but because of its cruelty it has been the target of criticism. Eventually, despite opposition by the farmers claiming that their livelihood will disappear if the fox hunting is banned, hunting of foxes, deer and rabbits with packs of dogs was banned in February of 2005. Many people in our society misinterpret cultural relativism and use it to say that traditional indigenous practice must be unconditionally accepted. This is the argument used for English fox hunting, Korea’s dog meat consumption, France’s foie gras, Japan’s dolphin killing and Spain’s bullfighting-these are all seen as indigenous cultural activities that should continue. However, even within these societies people are increasingly rejecting what others insist are traditional practices that shouldn’t change. Spain has even begun banning bullfighting, starting with its second major city, Barcelona. Criticizing certain cultural practices is not a rejection of a region’s entire culture or a judgment on whether any one ethnic group or race as superior or inferior. It is a rejection of cruelties that are no longer acceptable in modern civilized society. Cultural relativism cannot be used to try to silence growing criticism and it cannot be used to justify cruelty. 7. Is opposition to dog meat slavishly following West standards? Working mother and a Hindoongi (white dog) sitting next to her and keeping her company. The mother trims green onions and laments about her misfortunes to the Hindoongi, who might understand her heart and mind better than anyone else. Is it okay for a dog such as this Hindoongi, who licks our mother’s hands with a warm and innocent look on his face, to become a mere meal? Is there a justifiable reason why this should be so? 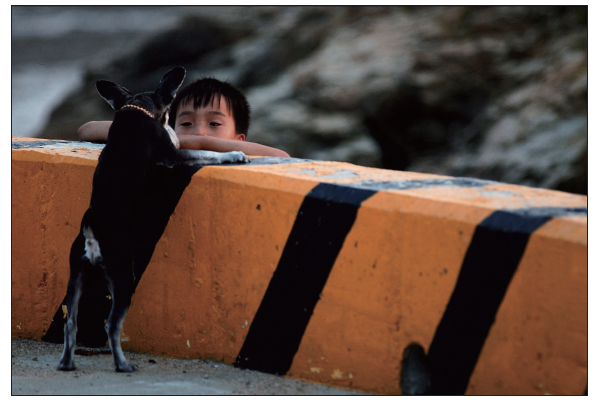 ©Tak Ki-Ho, KARA <'Koreans and Dogs' Photo Exhibition> Runner-up. Some people argue that opposing dog meat consumption in Korea is nothing more than bowing to Western standards and influences. 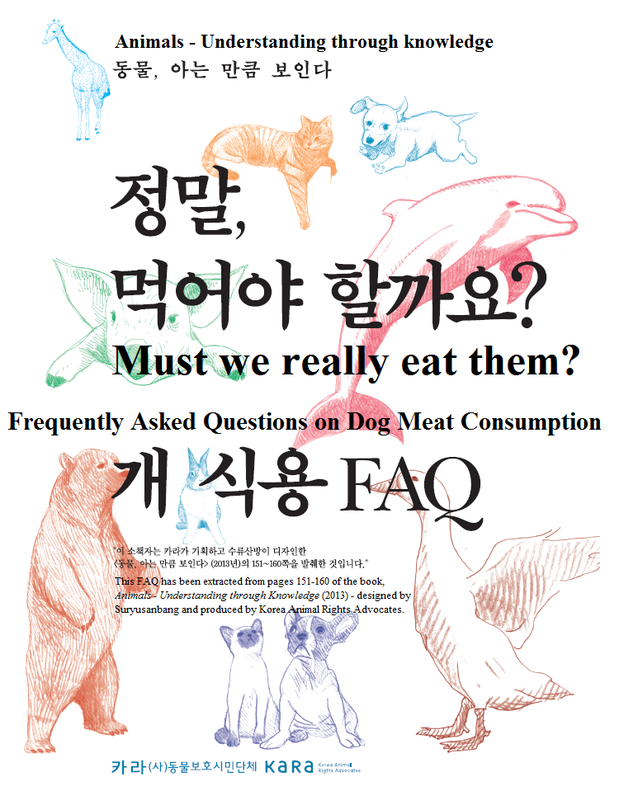 They think the reason some Koreans oppose dog eating is just because Westerners dislike it. However, that is a huge misunderstanding. Dog meat consumption is an issue concerning “humans and dogs” and has nothing to do with “our country and other countries”. We are not swayed by whether people in other countries like it or dislike it. So supporters of dog eating must abandon their “dog meat nationalism” and their victim mentality of “Who’s criticizing us?” Instead, they should carefully examine the true nature of the problems surrounding the dog meat issue. 8. But isn’t dog meat good for our health? Dogs are sensitive and active animals that become ill and diseased due to the stress of being raised in crowded small cages. Because of this, antibiotics are overused to keep them alive, and in the case of large dogs often 10 times the normal amount is injected. So, eating dog meat means eating meat that is saturated with antibiotics. Consuming meat concentrated with antibiotics causes a severe toxic effect on a person’s liver and an endocrine disruption that can cause variety of cancers and diabetes. Moreover, food wastes fed to the dogs contain toothpicks, napkins, and the saliva and bacteria of many people and are usually infested with flies, roaches, rats, making dogs the carriers of diseases dangerous to human health. 9. If dog meat consumption were legalized, wouldn’t it lessen the cruelty? If dog meat consumption is fully legalized by classifying dogs as livestock, their treatment and environments will become even worse. Activity will remain limited for these dogs to fatten them up, and there is no reason to stop raising them up in cages, or bursting their ear drums to prevent them from barking, or limiting the amount of water they can drink to reduce their energy and make them eat less. There are many corrupt and unethical dog farmers that would be impossible to control even with legalization. Moreover, if dog meat becomes legalized, it will increase the perception throughout society that dogs are “animals allowed to be eaten.” Then, the abuses and cruelty towards dogs would simply continue and government regulations would become meaningless.